Shillong, Aug 23 : For sometimes now there has been a raging controversy regarding Chief Minister Mukul Manda Sangma’s Scheduled Tribe (ST) status and the matter has reached the Meghalaya High Court. Some associations, including the Garo Students’ Union (GSU) and the All North East Indigenous Garo Law Promoters’ Association (ANEIGLPA) have opposed Mukul Sangma’s ST status. The controversy began when one Monindro Agitok Sangma challenged Mukul’s ST status way back in 2004 and filed a petition. In March 2010, the Shillong bench of Gauhati High Court disposed off the petition. Last week, the advisor of ANEIGLPA, Tennydard Marak again filed a petition. The controversy is regarding Mukul’s mix parentage and the surname he adopted. The Garos are a matrilineal tribe and surnames therefore are inherited from the mother. 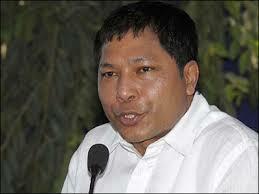 The Chief Minister’s father is Binoy Bhusan Maji Marak from the Garo community. His mother was Roshanara Begum and embraced Christianity after her marriage. After questions were raised how Mukul got the Sangma title when his mother’s surname was Begum and was a non-tribal, it was said that Roshanara Begum was adopted by one Rikmi Manda Sangma in 1960 as her daughter and so the title. A legal deed of adoption was also shown as proof. However, the ANEIGLPA said that neither the adoption was done under the customary norms of the Garos, where both sides of the clan (mother-father) hold a meeting for the adoption, neither was the legal deed of adoption was done during Roshanara Begum’s lifetime. “The affidavit of adoption of Roshanara Begum was done in 2008 after her death,” Tennydard Marak said today. He claimed that the Electoral Voter’s Identity Card showed Roshanara Begum going by her maiden name till her death in 2006. Based on these arguments some of these associations are staing that Mukul is not a Garo and also not a ST.